Figure 1 provides a breakdown of the social security and welfare category showing key sub-categories including major payments and services. Source: Australian Government, Budget strategy and outlook: budget paper no. 1: 2019–20, pp. 5-22–5-26. The biggest driver of growth in social security and welfare continues to be the NDIS. Total funding for the scheme is expected to grow from $13.0 billion in 2018–19 to $24.8 billion in 2022–23. Just over half of the total $88.1 billion in NDIS expenses from 2019–20 to 2022–23 is contributed by the Australian Government ($45.7 billion) with states and territories contributing the remaining funding. The Budget notes that some of the Commonwealth expenditure on the NDIS will be counted twice as National Disability specific purpose payments to the states and territories cease—part of these payments are repaid to the Commonwealth and then counted again as expenditure on the NDIS (p. 5-24). The full scheme was meant to be up and running nationally in 2019–20, supporting 460,000 participants aged under 65. The Government notes that there has been a ‘slower than expected transition of participants into the NDIS’ and as at December 2018 there were 244,653 people accessing the NDIS. This has reduced projected expenditure on the scheme since the Mid-Year Economic and Fiscal Outlook 2018–19 by $1.6 billion over the forward estimates (p. 3-22). The reduction in projected expenditure was expected to be even higher until a decision was made on 30 March 2019 to increase prices paid to service providers. The Budget provides information on growth in expenses accounting for inflation—that is, growth in real terms (pp. 5-22–5-24). The tables below provide information on nominal expenditure. Overall expenditure on assistance to people with disability is expected to grow by 4.5 per cent in real terms from 2018–19 to 2019–20 and by 10.0 per cent in real terms from 2019–20 to 2022–23. Income support for people with disability (primarily the Disability Support Pension (DSP)) is expected to decrease by 2.3 per cent in real terms from 2019–20 to 2022–23. This decrease has been primarily driven by a range of policy changes relating to eligibility and assessment processes, implemented by both Labor and Coalition governments. The government administrative data shows that the number of DSP recipients has declined from 832,024 people in December 2013 to 750,045 people in December 2018. (a) Includes both Commonwealth and state contributions to the NDIS through the National Disability Insurance Agency, a Commonwealth agency. Source: Australian Government, Budget strategy and outlook: budget paper no. 1: 2019–20, p. 5-24. 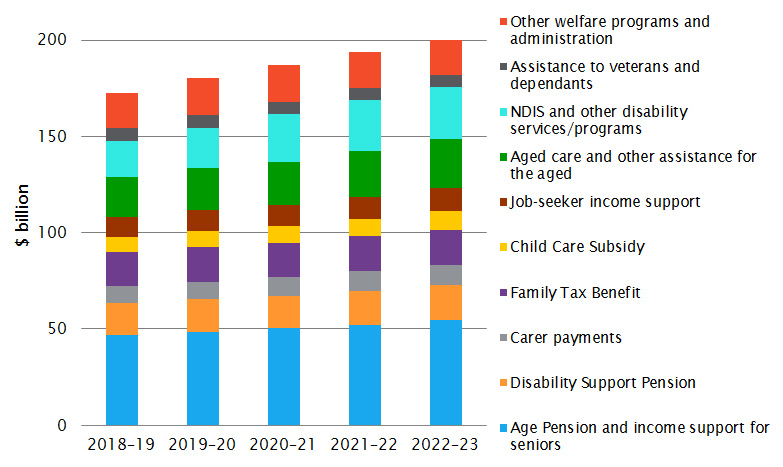 The biggest component of social security and welfare expenditure, the Age Pension and other income support for seniors will increase from $46.7 billion in 2018–19 to $54.8 billion in 2022–23. Growth in Age Pension expenditure is being partly restrained by the commencement in 2017 of a Rudd Government measure to gradually increase the pension age to 67 (pp. 17–22). Expenditure on aged care is expected to increase by 11.2 per cent in real terms from 2019–20 to 2022–23. Nominal expenditure will increase from $20.0 billion in 2019–20 to $23.9 billion in 2022–23. This growth in expenditure is primarily driven by demographic changes (an ageing population) and the impact of the 2018–19 budget measure More Choices for a Longer Life—healthy ageing and high quality care. Notes: Totals may not add due to rounding; ‘‑’ means zero. Source: Australian Government, Budget strategy and outlook: budget paper no. 1: 2019–20, p. 5-23.
expenditure on assistance for Indigenous Australians not elsewhere classified will decrease by 6.6 per cent in real terms from 2019–20 to 2022–23. The Budget attributes this decline to a significant expenditure from the Aboriginals Benefit Account in 2018–19 but decreased expenditure over the forward estimates, and the 2019–20 budget measure, Single National Mechanism for Commonwealth Legal Assistance, which will shift where funding for Aboriginal and Torres Strait Islander legal services is reported in the budget papers to the Courts and Legal Services sub-function of the Public Order and Safety function (pp. 5-25–5.26). A change to the way income is assessed for social security payments is expected to provide $2.1 billion in savings over the forward estimates, the largest single savings measure in the 2019–20 Budget (p. 33). Currently, income support recipients with employment income need to calculate and report the income they have earned in a payment fortnight; that is, the amount they should be paid for the hours of work they have undertaken in that fortnight, not the income they have actually receive in that fortnight. Under the change, income support recipients will report the income they receive from their employer in a relevant fortnight and the Department of Human Services will match the reported income with the amount their employer has reported to the Australian Tax Office through the single-touch payroll system to detect any discrepancy that would affect their payment rate. The measure is expected to result in savings through more accurate income reporting, and therefore fewer overpayments. As overpayments are considered debts to the Commonwealth, the savings would not be derived from reducing currently identified overpayments—rather, the measure appears to be deriving savings from reducing overpayments that would not previously have been identified. The Budget includes a one-off Energy Assistance Payment of $75 for singles or $125 for couples to be provided to pensioners and certain veterans’ affairs payment recipients. In the initial announcement, recipients of allowance payments such as Newstart Allowance and Youth Allowance were not eligible for the payment. However, in tabling the Bill for the payment, the Government reversed this position and expanded eligibility to all allowance recipients. The measure announced in the Budget was expected to cost $284.4 million over two years (p. 159) while the expanded measure is expected to cost $365.0 million over the forward estimates. Existing trials of the cashless debit card will be extended for one year, and the cashless debit card will replace the BasicsCard system used for income management in other locations around Australia, including the entire Northern Territory. The measures will cost $128.8 million over the forward estimates (p. 157). An additional $84.3 million will be allocated to the Integrated Carer Support Service (p. 162). Under the measure, carers will be able to access up to 5,000 financial packages worth up to $3,000 through a network of Regional Delivery Partners. Up to 25 per cent of all packages will be reserved for young carers to support their continuing participation in education or employment. Services available through the packages can include transport and respite. The Budget includes $724.8 million over five years from 2018–19 for increased aged care funding and quality regulation, much of which was announced in February 2019. Some of the funding has already been included in the forward estimates. Residential aged care providers will receive a $320.0 million short-term increase in funding in the form of a 9.5 per cent temporary increase in the basic subsidy for residents from 20 March until 30 June 2019. The financial performance of residential aged care providers has been declining since 2016, when changes to the basic subsidy were made. The Budget also includes $4.6 million to trial an alternative residential aged care funding tool. If adopted more broadly, this tool would change the way that funding for residential aged care (including the basic subsidy) is calculated. The Budget provides 10,000 additional home care packages across all levels, at a cost of $282.4 million over five years from 2018–19. This is in addition to the 10,000 high-level packages announced in the Mid-Year Fiscal and Economic Outlook 2018–19. Home care packages are coordinated packages of care which assist older people to stay at home rather than entering residential aged care. While providing a significant increase in the number of packages available, this measure will not be enough to clear the waiting list of around 128,500 people who are either not receiving a package at all, or not receiving a package at their approved level of care. The Budget includes a number of measures to increase the regulation of quality in both home and residential care. The largest of these in dollar terms is $38.4 million over five years from 2018–19 to establish a real-time information sharing system within the Aged Care Quality and Safety Commission. The purpose of the system is to help the Commission quickly identify and respond to poorly performing providers, while continuing regular monitoring of all providers. The Commonwealth Home Support Programme (CHSP) will be extended for two years to 30 June 2022 at a cost of $5.9 billion, which has already been included in the forward estimates. The CHSP is the entry-level aged care program and provides services such as social support, transport, help with domestic chores, personal care, home maintenance, home modification, nursing care, meals and allied health services. The CHSP was last extended in the 2017–18 Budget, and current CHSP grant agreements with providers expire on 30 June 2020. In the Budget, the Government announced it would no longer proceed with a 2016–17 budget measure to establish the National Disability Insurance Scheme Savings Fund (p. 8). The fund was intended to be a special account that would capture savings from other measures—such as the recently reversed 2016–17 budget measure to close access to the Energy Supplement to new income support recipients—to be redirected to the NDIS. The Government has been unable to pass legislation to establish the fund and the budget papers state that the ‘positive budget position means that future funding for the NDIS has been secured’ (p. 8). $148.8 million over three years to the Department of Social Services, the National Disability Insurance Agency and the National Disability Insurance Scheme Quality and Safeguards Commission to provide counselling services and other support to people with disability in connection with their participation in the Royal Commission. The Budget provides $328.0 million over four years from 2018–19 for projects and priorities under the Fourth Action Plan of the National Plan to Prevent Violence Against Women and their Children 2010–2022. The Fourth Action Plan, which will cover the period 2019 to 2022, is the final action plan under the National Plan. This measure follows the Government’s announcement of 5 March 2019. Detailed information on how the funding will be allocated can be found in the document Our Investment in Women’s Safety. Not all of the funding for this measure is counted as social security and welfare expenditure.
. Media commentary has suggested ‘dramatic delays in both the scheme transition but also the signing of agreements for “full scheme” with the states and territories’. R Morton, ‘NDIS has $5bn in hand but costs are set to soar’, The Australian, 3 April 2019.
. For an explanation of the differences between the two cards, see D Arthur, ‘BasicsCard and Cashless Debit Card: what’s the difference’, Parliamentary Library blog, 23 June 2017.